I recently received an Austin Ribbon mic kit from Rick Wilkinson (Rickshaw Records) out in California. Unfortunately, I can’t say I’m the proud owner… this mic is going to be built and given away as a door prize at the DIY panel at the Producers and Engineers Summit at Welcome To 1979 in November. I haven’t finished the build yet, so I can’t give a complete review of the mic, but I can make some comments about the kit and the resources that come with it. 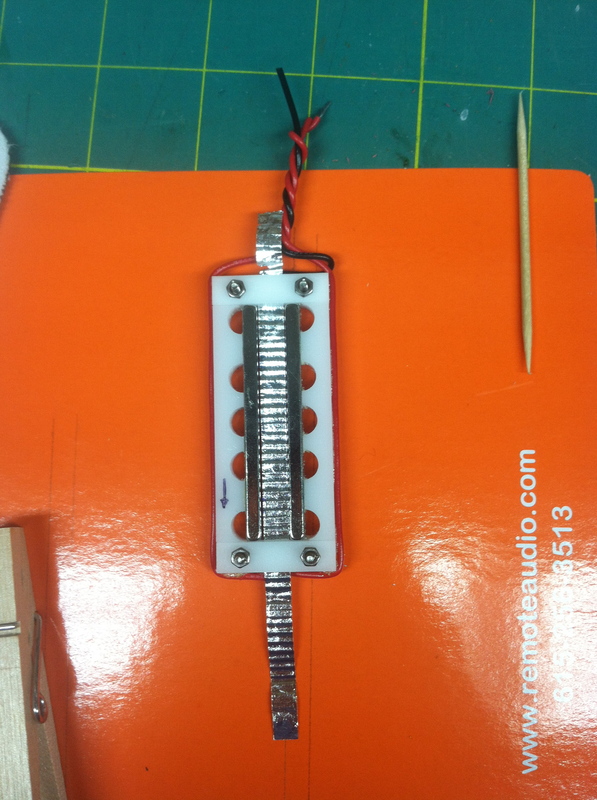 Building a ribbon mic is not that complex- IN THEORY. It’s just a thin metal ribbon suspended between two magnets. There isn’t much electronic inside the mic, just a transformer. The design has been around since the 30’s. The theory is simple. But like most things, it’s the Devil in the details. You can find articles and instruction on the web for free. And that’s what I started to do years ago. I got halfway through the project and shelved it… there wasn’t enough detail for me to be successful. Or you can spend some money and increase your chances. Rick sells plans for ten bucks, or his ribbon kit for $275 with a Cinemag transformer. (There is a less expensive version with a stock transformer, and I understand the stock transformer is exceptionally high quality. It’s sold out right now, but should be available again shortly) Rick sent me a kit with a Cinemag transformer, so that’s the version I’m reviewing here. The greatest value for me, though, is Rick’s instructional materials. When you buy a kit (or his plans), he sends you a link where you can download PDF instruction manual and several videos where he goes through the process of building a mic. These videos are really helpful, especially when it comes to corrugating and installing the ribbon. Ribbon-making details is a big advantage of his instructions, but it isn’t the only one. For example, I learned that you can use a brass footrail cap on the bottom of your mic to hold the XLR connector. These things are nice, solid castings, and if you shop around, you can find them at about $5 apiece. (I wish I’d thought of that.) Circular Switchcraft connectors fit well in these caps. This would be a good solution for any tubular-bodied homebuilt mic. The videos do have a slight downside. You have to remember that Rick has built a lot of mics, so some of the things he does in the videos look easier than they will be to folks like you or I. It’s really difficult to explain the things that practice teaches you. But I’m pretty sure that I’ll have a working ribbon mic once the dust settles… I’ll keep you posted. UPDATE: I finally got up the nerve to install the ribbon today. It worked on the second try, which really isn’t bad. I’m pretty sure that my success with this is pretty much due to Rick’s instruction. Like I said previously, I’ve tried this before and failed miserably. Seeing it done (in a video) makes all the difference. A just-placed ribbon in the motor frame. This job requires lots of patience, but it can be done. That is not to say, however, that it was easy. The foil is the definition of flimsy… if it were any thinner I think it’d fly off my bench because of the rotation of the earth. Using the more expensive 2.5 micron foil should be easier (though I expect still no picnic), and that’s what I’m planning for my own ribbon motor frames. (I figured this one should be made as a stock kit, in order to give a fair review.) There will be some slight differences, like slightly thicker magnets… I’m still in the design and prototype phase. But if they work, it’ll be fun to try some design variations like waffle plates (resonators) and silks.